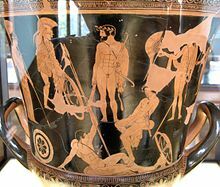 Gatherin o the Argonauts, Attic reid-figur krater, 460–450 BC, Louvre (G 341). The Argonauts (Auncient Greek: Ἀργοναῦται Argonautai) war a baund o heroes in Greek mythologie, wha in the years afore the Trojan War, aroond 1300 BC, accompanied Jason tae Colchis in his quest tae find the Gowden Fleece. Thair name comes frae thair ship, Argo, named efter its bigger, Argus. "Argonauts" leeterally means "Argo sailors". Thay war whiles cried Minyans, efter a prehistoric tribe in the aurie. This page wis last eeditit on 11 Mairch 2017, at 04:08.